Much like the toasters, smartphones, and Minions statues that decorate the London Museum, Mortal Engines feels like the relic of a bygone era – a time when audiences cared about dystopian fiction, and “strong female characters” were little more than toughened blank slates. Mortal Engines might take place thousands of years in the future, but it’s a movie that’s stuck in the past. Co-writer Peter Jackson secured the rights to author Philip Reeve’s Mortal Engines book series back in 2009, but couldn’t work on the adaptation until recently because of other projects, like The Hobbit. When we asked Jackson at New York Comic Con why he chose to make the movie now, he said it was for one reason: He didn’t want to lose the rights. This is kind of what Mortal Engines ends up feeling like – a film that only exists so someone else can’t take it. Directed by Christian Rivers, who’s known for his VFX work (mostly on Jackson’s previous films), and written by Jackson, Philipa Boyens, and Fran Walsh, Mortal Engines takes place in a post-post-apocalyptic world where societies have been replaced by giant moving cities that prey upon smaller communities. A young woman named Hester Shaw (Hera Hilmar) boards the massive city of London to kill historian Thaddeus Valentine (Hugo Weaving) as revenge for the death of her mother – only to be thwarted by an apprentice named Tom Natsworthy (Robert Sheehan). Little do both of them know that Thaddeus has something so diabolical in mind it could destroy the world for a second time. The movie kind of does us a favour by giving us the best part within the first 15 minutes: the opening chase sequence (which I described here). 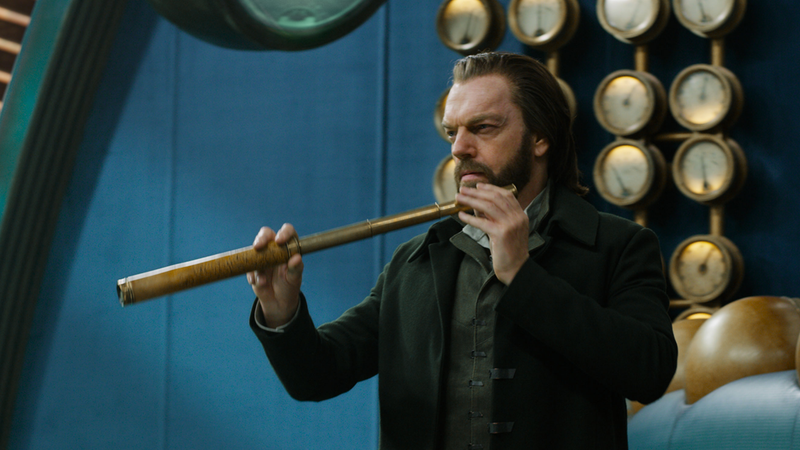 While most of Mortal Engines is a by-the-numbers dystopian teen saga, the chase between London and a small mining town is a feast for the eyes. Since I’d already seen it at New York Comic Con, and thus didn’t have to take notes again, I chose to simply sit back and enjoy it. You can tell that Rivers’ background is in visual effects, because every second of that sequence is dripping with style. 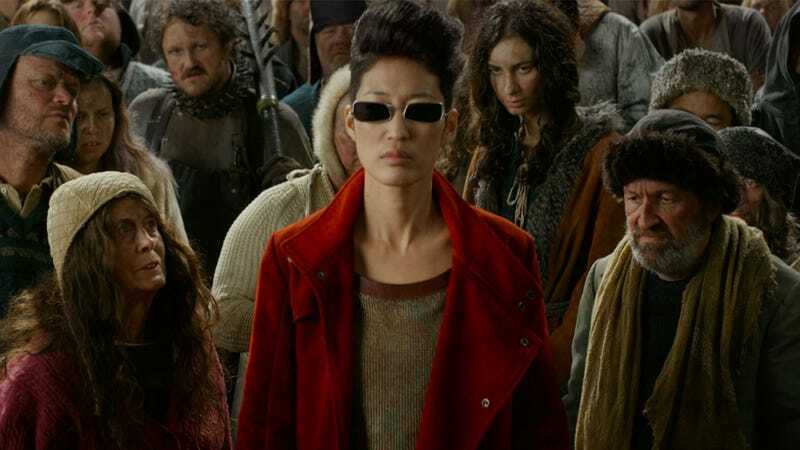 I’d almost recommend seeing the movie just for that part – and single-named performer Jihae as the rebel leader Anna Fang, who is so cool it almost hurts. Yeah, there’s one character in the movie who is so strange, so out of place, that I can’t not talk about him. And that’s Shrike. Played by Stephen Lang (Avatar), Shrike is a CGI robot man with green eyes who quasi-kidnapped Hester after her mother died, raising her as his own. He has this weird possessive thing with her that feels like it’s trying to channel themes of male entitlement for female companionship – as recently shown in Ralph Breaks the Internet – but it fails because it’s barely addressed. When a movie designed to cash in on a fad takes almost a decade to come to fruition, it’s going to come in at a disadvantage. Hunger Games has been over for years. Maze Runner barely skirted through with its final movie in January. Divergent was killed off before it could even finish. People aren’t interested in dystopian fiction anymore. If you’re going to release a movie that few people are clamouring to see, following a trend that’s been near extinction for years, you have to do something to make it stand apart. Mortal Engines didn’t do that. It exists, and that’s pretty much it. The film might have some impressive visual effects, but the movie belongs in a museum.